Coat the bottom of a large shallow cast iron skillet or braising pan with olive oil and heat on medium heat until hot. Season the chicken on both sides with salt and pepper and then brown, skin side down for about 15 minutes, until the skin is nice and crisp. Flip the chicken and cook for another 15 minutes, or until done. The meat should read 160F on an instant read thermometer. Set aside on a plate and cover with foil, or put in a warm oven while you make the sauce. Add the shallot and garlic to the pan and saute, stirring constantly, for a couple of minutes. Then add the Marsala wine and let it bubble down while you scrape up the browned bits from the bottom of the pan. Add the chicken stock, heavy cream, and sun dried tomatoes, and cook the sauce for a few minutes until it starts to thicken, stirring frequently. Scrape up everything from the bottom and sides of the pan into the sauce. NOTE: This isn't a super thick sauce, but it will thicken somewhat as it cooks. Add the cheese and stir until incorporated. Add the chopped spinach and fresh tomatoes to the pan, and cook until the spinach has wilted. 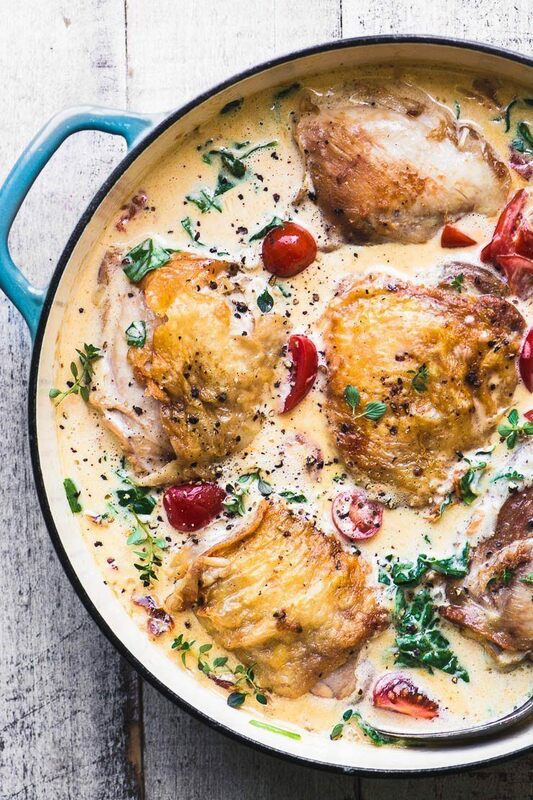 Add the chicken back into the pan and heat through before serving, garnished with fresh parsley or thyme.